In honour of St. George's Day, something a little different to spice up your celebrations - this is what makes a dragon breathe fire! 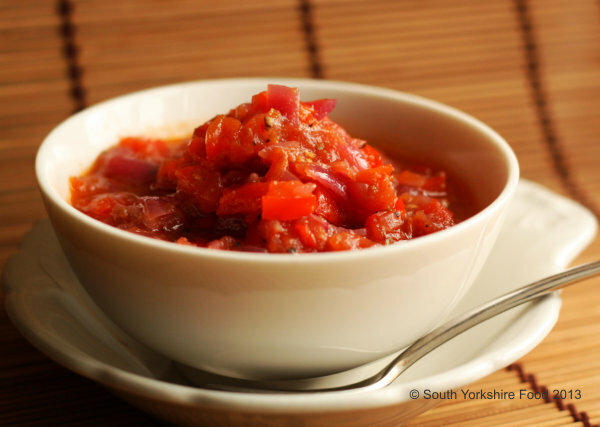 Dragon's Breath Relish is a quick and easy to make spicy relish, that is very versatile. Add it to soups as a base, spice up a stew or a pasta sauce, spread it on crostini, or as a great accompaniment to grilled meats or fish. Try it with a poached egg on toast - it's really good! Heat the olive oil over a medium heat and sauté the onion, pepper, chillies, garlic, cumin, oregano, and bay leaf, for about 5 minutes until the onion is soft and translucent, but not brown. Add the tomato, salt and pepper, honey, dark brown sugar, and lime juice, and cook until the liquid in the mixture is reduced by about a third and starting to thicken. Leave to cool, and store in a clean glass jar. It will keep in the refrigerator for about a week.